A Core-Independent, ADC with Computation (ADCC)-based soultion to microwave motion sensing by using the PIC16F18446 Xpress Board and the Microwave Click. This example demonstrates how to use the computation features of the 12-bit ADC with Computation (ADCC), along with other intelligent peripherals on PIC16F18446, to create a core-independent solution to microwave-based motion sensing. A combination of the peripherals on PIC16F18446 can provide a hardware-based solution with minimal software routines and CPU interference. Therefore, in a typical sensor node application like this, the CPU can be put into sleep mode for most of the time to reduce power consumption (especially for a battery-powered application), or take time to do other tasks to increase system functionality. It uses the Microwave Click from Mikroelektronika, and a PIC16F18446 Xpress Board. The LED on the Xpress Board will be turned on, and a message will be sent through the serial port when there is a motion. Before using, press the pushbutton on the Xpress board to calibrate a reference first. The calibration takes around half a second. Before we get started, let's take a moment and briefly look at how the motion sensing works with a Microwave Click. The Microwave Click can detect movement or proximity by using the Doppler effect. 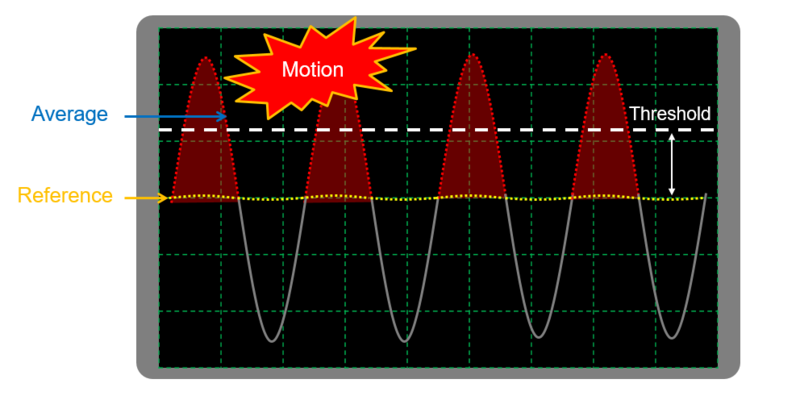 The on-board microwave motions sensor transmits waves, and picks them back as they hit an object, with their frequency changed. For more information on the Click, please visit the Microwave Click webpage. A software-based solution has been introduced on the previous Click webpage. The topology is shown below: A calibration is needed at first to take dozens of samples when there is no motion, and average them to get a reference value. After the calibration is done, only the samples that are larger (you can also take smaller) than the reference will be saved. Then, take the average of a fixed amount of saved samples and compare it to a threshold. If the averaged result is bigger than the threshold, it is considered to be a motion. 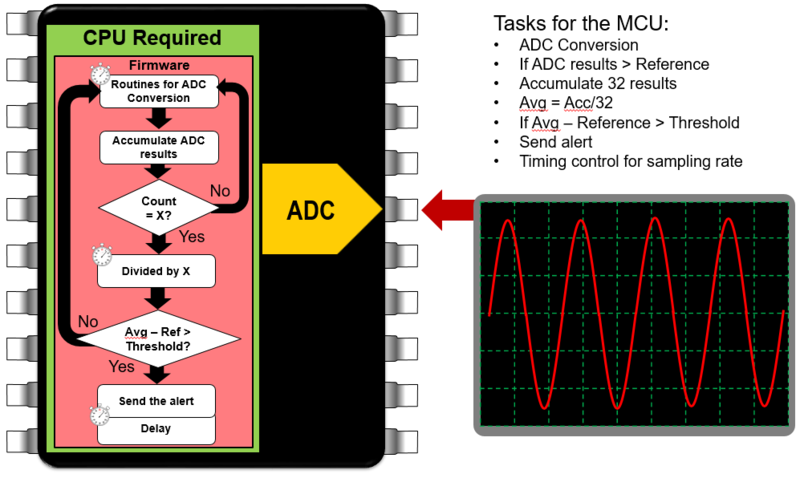 Here is a typical software-based implementation when using a microcontroller without ADCC and other core-independent peripherals: To achieve all the tasks listed for the MCU, a basic ADC is only used to sample all the data, and the CPU is having a code-heavy routine in the main loop to process the data. Note the little clocks in the above diagram. It indicates that those routines in software are consuming most of the time. For example, a divide operation is going to take a lot of time for a MCU without a hardware divider. Thanks to the ADCC with its powerful computation feature, a lot of the tasks can be done within the peripheral. 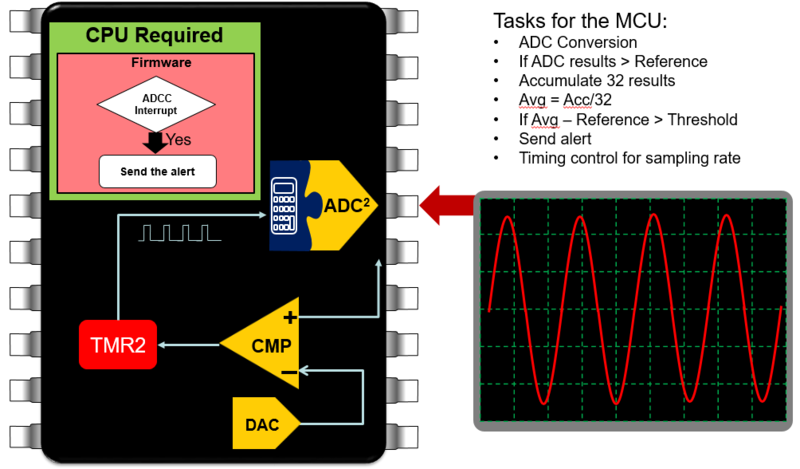 Moreover, with a combination of ADCC, Timer2, Comparator, and DAC, most of the motion detection algorithm can be achieved in hardware: Note that with this implementation, the only task that the CPU needs to do is to issue the motion alert once there is an ADCC threshold interrupt. The procedure to make this work is not as complex as it looks. 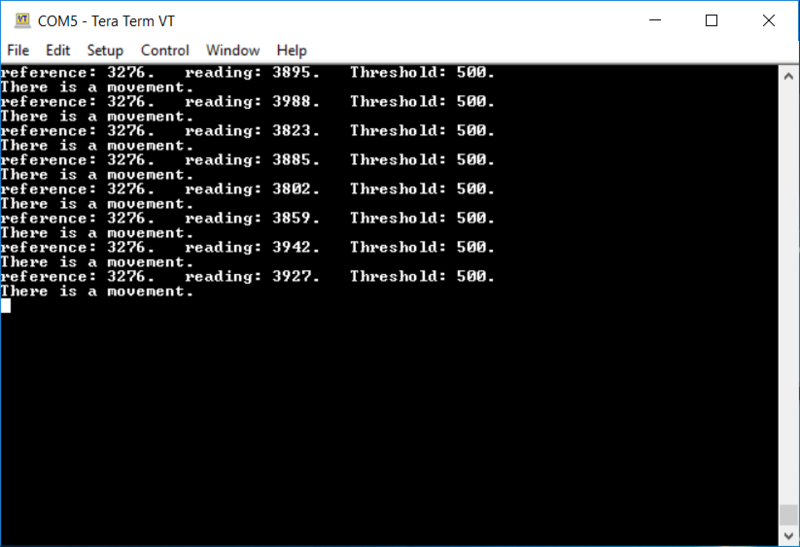 In general, the ADCC is triggered by Timer2 to convert the samples, and its averaging with threshold comparison feature is going to take care of the computation tasks. The Hardware Limit Timer feature of Timer2 allows it to set the Comparator as an External Trigger Source, so it runs when Comparator's output is high. The combination of Comparator and DAC can output a high value when the waveform is higher than the reference value. Therefore, only when the waveform is higher than the reference value, Timer2 will start running, which triggers the ADCC conversion. With this setup, the ADCC converts sample automatically when the waveform is higher than the reference, and does the averaging and thresholding within the peripheral. This example uses the PIC16F18446 Xpress Board as the main control board, and the Microwave Click as the sensing unit. The circuit can be easily set up by plugging the two boards and three wires on a breadboard. Plug both the PIC16F18446 Xpress Board and the Noise Click into a breadboard. Use a wire to connect ground, with the Ground symbol pins on both boards. Use another wire to connect Vdd. Connect "3V3" pin on the Click to the pin just above RA5 on the Xpress Board (you can see it as VTG on the back of the board). Please note that according to the specifications of the Microwave Click, a 5V power supply is recommended. The PIC16F18446 is capable of running at a 5V Vdd. I used the 3.3V just because it's coming straight to the board, so I don't need an extra power supply. Use a third wire to connect your AN pin on the Xpress Board (in my case, RA1) to the "OUT" pin on the Click. In order to achieve the functionalities of all the peripherals above. MPLAB Code Configurator (MCC) is used to configure them. Go to "File" >> "New Project" >> "Standalone Project". Then click "Next". Select "PIC16F18446" as the device. Click "Next". Type in a project name. Click "Finish". Open MCC by clicking on the MCC symbol on top left of the IDE panel. In "Device Resource", add ADCC to the project by double-clicking on it. 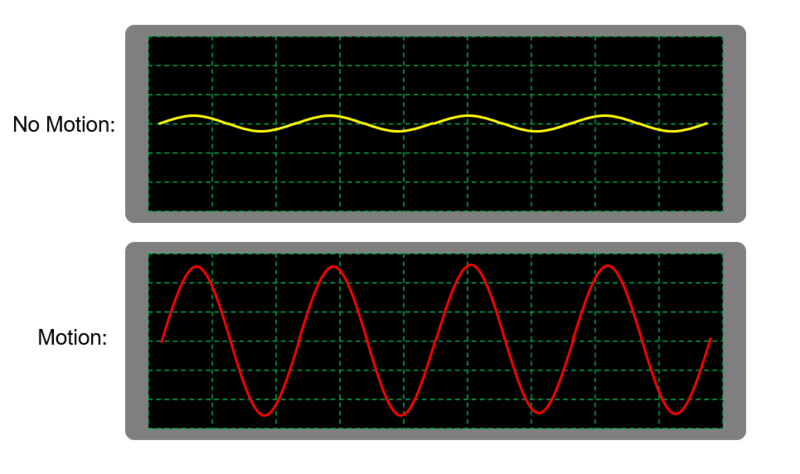 We are using the Average Mode of the ADCC with a threshold triggering interrupt. So enable the ADCC Threshold interrupt by checking the corresponding boxes. Expand "Computation Feature", select "Filtered result vs setpoint" as the Error Calculation, and leave the Setpoint blank since we are going to set it in run-time. Select "ADERR > ADUTH" as the Threshold Interrupt, so that the threshold interrupt is triggered whenever the ADC result is above the upper threshold. You can set your Upper Threshold in the "Upper Threshold" box, or leave it blank for now and set it up later in your code. We are going to use a hardware timer to trigger the ADCC auto-conversion, so that no software routine are needed to do the ADC conversion. 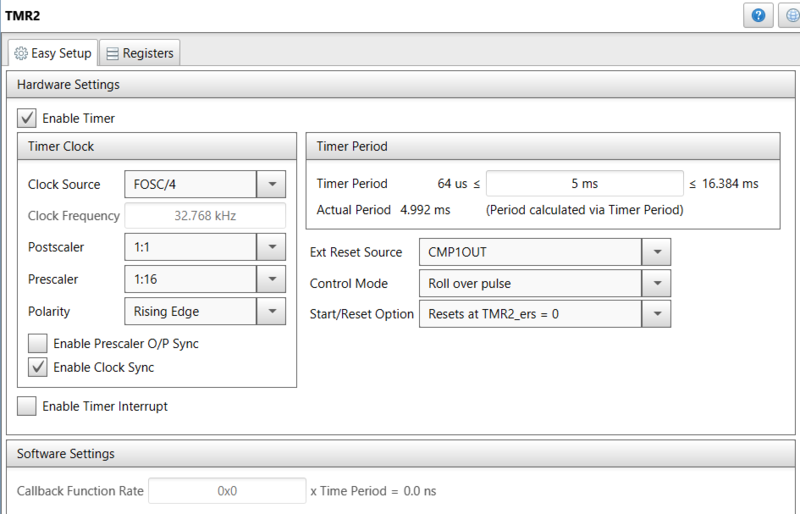 Under the "Auto-conversion Trigger" Tab, select a timer, such as Timer 2, to be the triggering source. Add Timer 2 to the project, as we are using it as the ADCC auto-conversion triggering source. We want the conversion to be triggered every 5ms. Select "Fosc/4" or "LFINTOSC" as the Clock Source, then set up the Prescaler or Postscaler to make sure that 200ms is within the Timer Period range. Type in "5ms" in the Timer Period Box. 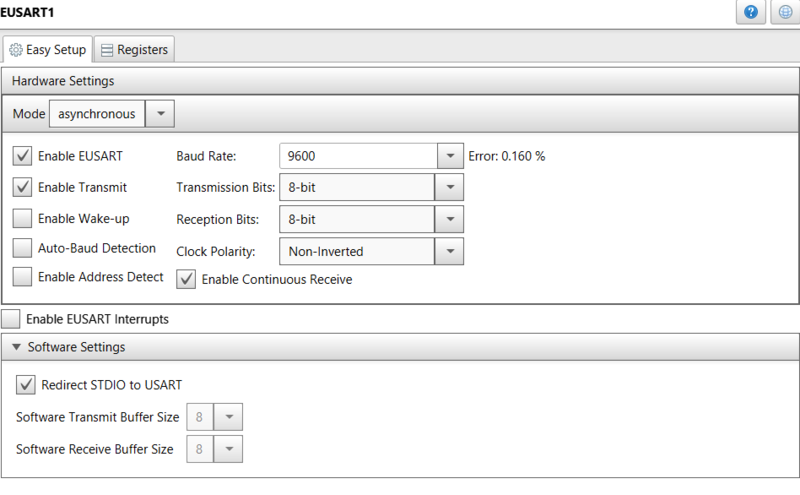 Select the Comparator as the External Reset Source and select the Timer2 to be running when the External Reset Source is high, so that if the Comparator is triggered high, Timer 2 starts running. Add Comparator to the project. 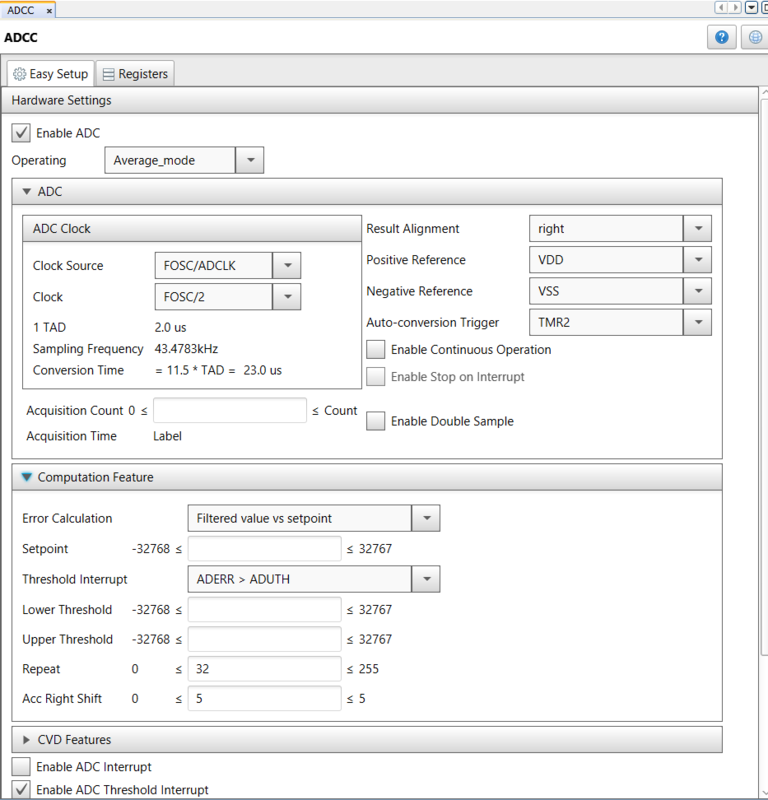 Configure the Comparator to have the right output for TMR2 to be triggered. Since the DAC can only be the positive reference of the Comparator, we need to invert the output of the Comparator so that it will output a high when the waveform level is higher than the reference. Add DAC to be the positive reference of the Comparator. The reference value should be fed into DAC after the Calibration. Add EUSART peripheral to the project, since we are using the UART communication to send data to the computer terminal. Enable Transmit, and enable "Redirect STDIO to USART", to be able to use "printf" statement. 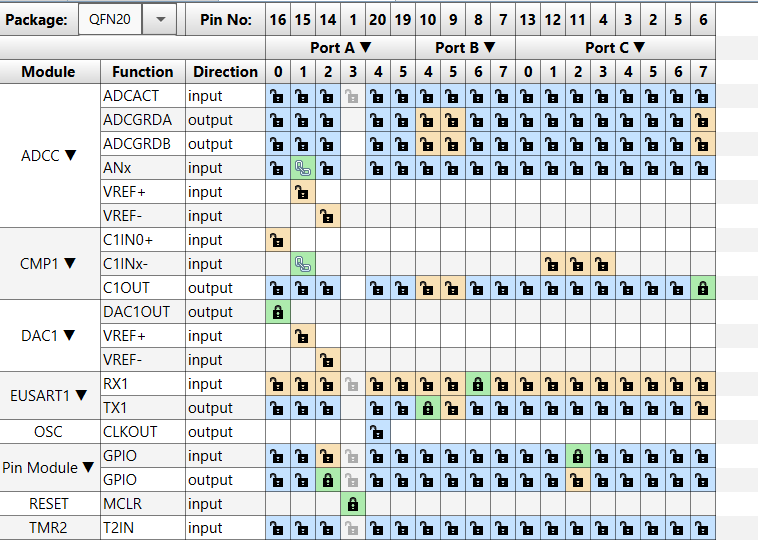 By checking the schematic of the Xpress Board, we know that RB6 and RB4 are the UART RX and TX pins. In "Pin Manager", set the RX and TX pin, and an AN pin as the ADCC input channel that connects to the Microwave Click AN pin (i.e., RA1). 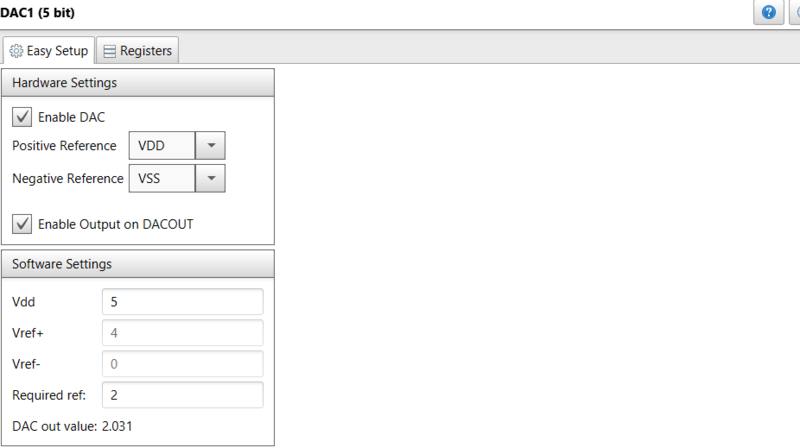 Then go to the Pin Module under System Tab, and customize the name of your AN input pin (i.e. Microwave_AN). Everything should be set up. Generate Project. Open a terminal on your computer by using terminals like TeraTerm, and connect the corresponding COM port of the Xpress Board. Note the settings of the serial port should be the same as the settings of the UART in MCC. As a result, you will see the noise level displaying on the terminal window, and an alert appearing whenever the motion level is above the threshold you set. And the LED on the Xpress Board should be turned on. Press the button on the Xpress board to re-calibrate the reference.